Folding bed - ideal not only for small apartments • JELÍNEK - výroba nábytku s.r.o. Do you have a small apartment and for the lack of space you sleep on the seat? Get a good quality sofa bed and stop making compromises in the quality of your sleep! 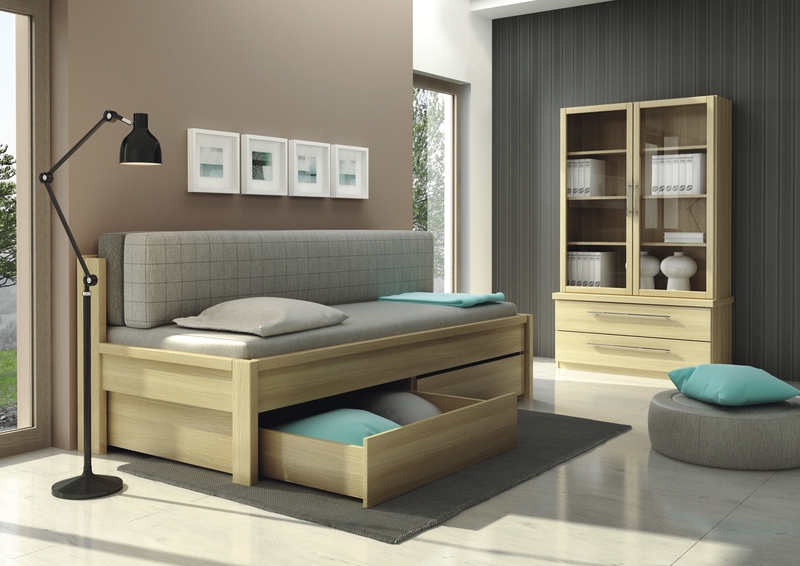 Folding beds are a great solution not only for a one-room apartment but are also suitable as sleeping for your guests. Their practicality and consistency will also be appreciated in huts or cottages. JELÍNEK offers you a practical double bed, DIANA, which perfectly combines the function of sitting and sleeping furniture. Its elegant design and high-quality craftsmanship will excite you. The great advantage is that it sits comfortably and lies, which will surely appreciate your back. The DIANA folding bed can be easily folded and disassembled at any time. Thanks to this, the sofa and sleeping bed can be simply represented. Because this unique double sofa bed, you can have a comfortable single bed and a spacious double bed for 2 people. The area of ​​the compound bed is 200 x 90 cm, in the case of half-decomposition the area is 200 × 130 cm. The area for bedding of the entire deck is 200 x 170 cm. In a folded state, the DIANA double bed provides an anatomically correct seating, including comfortable restraint. The bed is provided with exclusive DIANA mattress and DIANA backrest, which after layout serves as a mattress. The core of the sandwich mattress and the DIANA backrest is made of high quality PUR foam. The top layer of mattress and backrest can be selected from high quality foams such as TALALY LATEX, TERMOPUR, NAWAPUR and CELLPUR. For those interested, it is also possible to insert an orthopedic lamella mattress with a reinforced edge into the DIANA bed. You can also make the mattress in the DIANA bed in an upholstery fabric at an extra cost. The DIANA double bed has two practical drawers that can be used as a storage space for your duvets or other things. With this handy storage space, you can save yourself another place at home.